What’s the Difference Between Rash Guards and Compression Shirts? If you’re in the market for a new BJJ or MMA rash guard, you’ve come to the right place. Rash Guards were originally designed for surfers to wear underneath their wetsuits to stop chaffing (gross right). However, as surfers started moving into Brazilian Jiu Jitsu culture, so did their rash guards. So I guess you have those Cali surfers to can thank for all your comfortable roll sessions. Before rash guards existed, BJJ practitioners would often wear cotton t-shirts that could become very uncomfortable after hours of rolling. Many people who wear a cotton t-shirt under Jiu Jitsu Gi’s also find it very uncomfortable as well. I always recommend wearing rash guards in Gi or No-Gi because of the sweat-wicking technology found in rash guards. Muscle Compression helps prevent injury. There have been many studies on the correlation between wearing a rash guard during rolling can help speed up injuries due to the compression of the muscles. Just as there are compression braces that reduce injuries of the knees, ankles and elbows, rash guards can also reduce the occurrence of minor injuries. Reduce the spread of bacteria. When you’re rolling around, especially in a gi, it’s common practice to open the gi in order to destabilize your opponent, setup for gi chokes, or to use as leverage for a pass. During intense rolling sessions the gi will naturally open, exposing your opponent’s chest. This exposes much more skin surface area and increases the chance of bacteria exchange (which is a big no-no). Wick away moisture for better grips. I often find myself resetting my gi and re-aligning my belt after every few minutes of rolling. The more I roll, the more sweat accumulates. 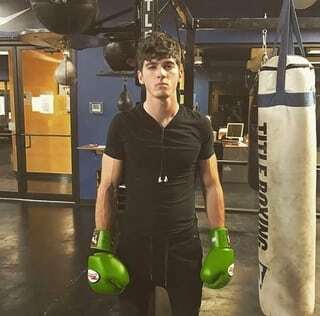 This increases the chances of me transferring that sweat to my hands in between rounds. This can be a serious disadvantage when trying to take advantage of an opponent in a submission such as a Kimura or arm bar. Sure, being sweaty can work to your benefit by slipping out of submissions, but more than likely it will work against your favor. Wearing a rash guard, will help alleviate some of that sweat transfer. Prevents mat burn. This is one of the original purposes of wearing a rash guard. When rolling no-gi, skin contact on your typical BJJ mat can cause friction scars which hurt like hell. Although the gi provides a barrier between the mat and your skin, it can worsen friction from rolling. The weave patterns on gi’s are specially designed to be strong and allow for griping, but it also creates a lot of unwanted friction. This is especially true for elbow passes or any other movements that require you to plant part of your arm on the mat. Wearing a rash guard can help avoid some of that friction as it’s surface is a lot smoother than your skin. The Metaru Charged is the holy grails of rash guards. Advanced compression with Titanium helps optimize body temperature, support circulation and maintain maximum muscle function. Inner silicone banding on hem to keep rash guard locked down. Breathable compression to support circulation. 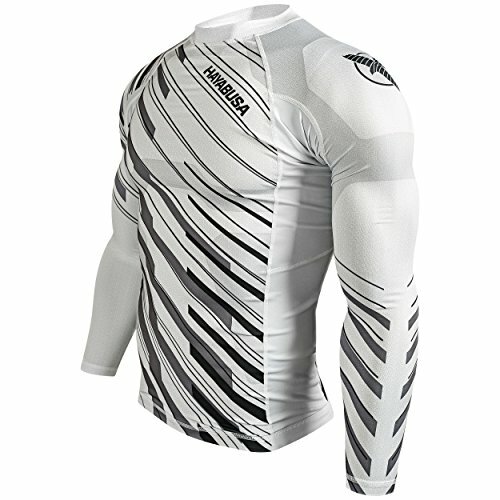 Anthem Athletics Helo-X is one of the most underrated rash guards on the market today. The reason you might’ve never heard of them is that they don’t pay for celebrity endorsements (helps them keep your cost lower!). 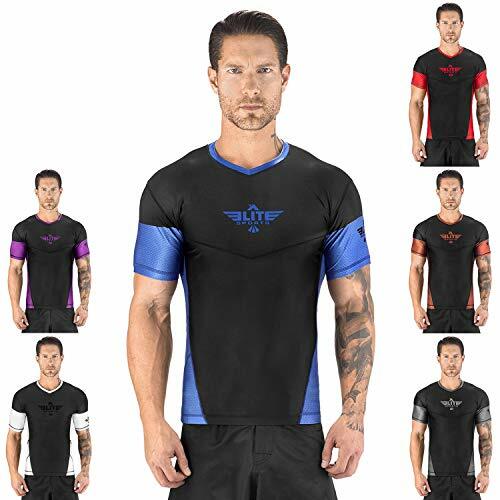 These rash guards are made from lightweight, ultra-strong, moisture-wicking, compression material. The best part about these awesome looking rash guards are that the graphics and logos will never crack or peel. Optimized for the highest level of athletic performance in BJJ (camo color options IBJJF approved), MMA, catch wrestling, no-gi, and submission grappling. Be sure to follow the size-chart provided on Amazon for the best fit. The Sanabul Essential rash guard provides you with all the features you’re looking for in a simple yet elegant design. Whether you need to show your Jiu Jitsu rank (IBJJF competition approved) or just want to match the rest of your outfit, Sanabul has what you need. 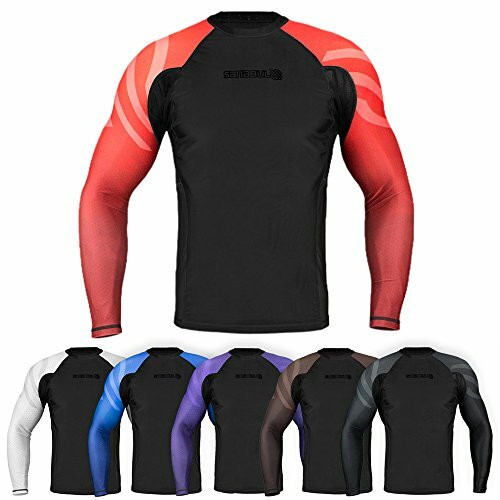 The Essential series rash guard also includes other features not commonly found in this product category, such as anti-microbial and anti-odor fabric treatments. Sanabul essentials rash guard includes UV SPF 50 protection for outdoor activities such as surfing! This also includes a ventilated mesh underarm area to help disperse heat. Amazing stretch material with graduated compression in the arms and upper torso for improved blood flow throughout muscles. 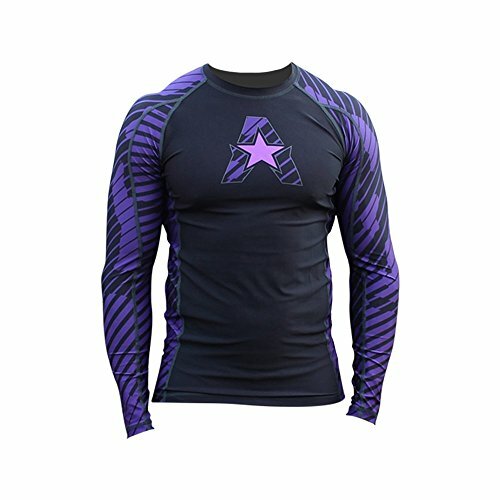 This rash guard is great for MMA, BJJ, Circuit training, surfing or any other exercise. 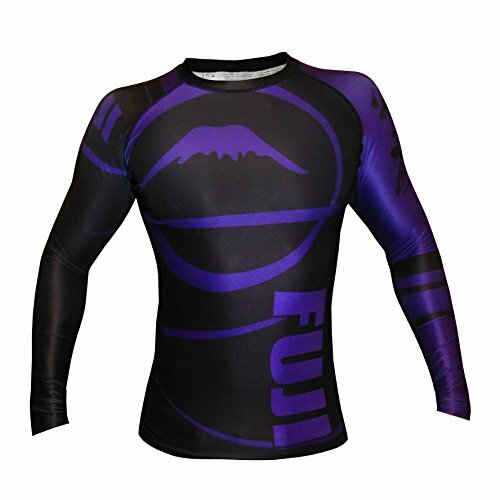 The Fuji Freestyle rash guard has a great design and excellent durability. This rash guard is made of high quality material which is super comfortable and perfect for training and competition. The reinforced stitching guarantees that your rash guard will stand the test of time. The Fuji Freestyle is IBJJF approved with various colors. It’s available in all belt colors and also available in short or long sleeve depending on your personally preference. This rash guard is perfect no matter if you’re a beginner or a pro. The best part is the anti-microbial fabric included in the rash guard that makes it safe from various bacteria and fungi. The Hypnotik 8-Bit Jiu-Jitsu rash guard is a throwback to a martial arts classic! 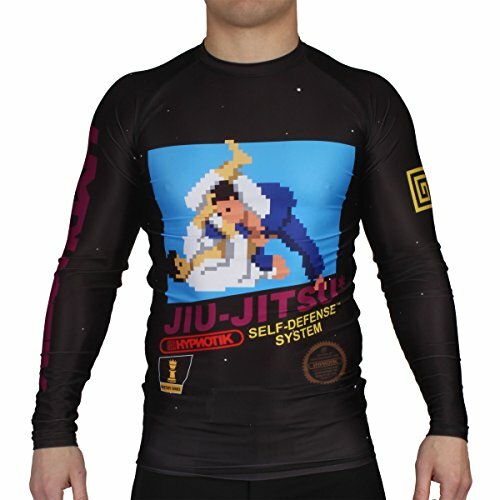 Fans of classic beat ’em up style video games and BJJ will dig the Hypnotik 8-Bit rash guard. Features 8-Bit Martial Arts inspired BJJ graphic. Manufactured with a very resilient fabric that wicks away sweat to help you stay dry. Antimicrobial technology inhibits the growth of bacteria and fungi. Advanced features and custom fit with features flat-lock stitching for stronger, flexible, and more comfortable seams. This rash guard was designed to guard against cuts, scrapes, or rashes. It will also keep your body dry and muscles warm. This rash guard can fit small or large based on your body type so make sure to use the size chart available. The Hayabusa Mizuchi 2.0 was designed with your comfort in mind. Engineered as a second skin to keep you body dry and comfortable, the Limited Edition Mizuchi long sleeve rash guard provides athletes with a precise fit for complete unrestricted movement. 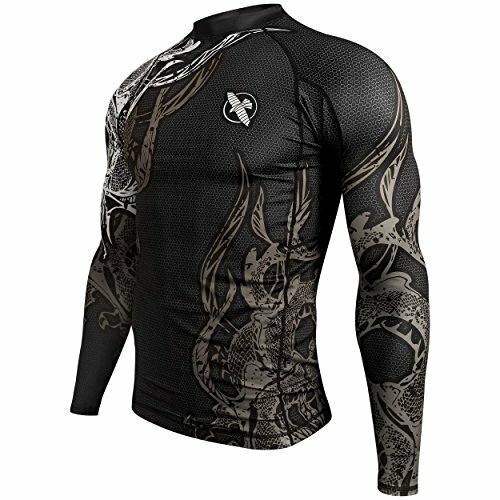 This rash guard was designed with the highest quality and craftsmanship. The Hayabusa Mizuchi 2.0 includes optimized compression which maximizes athletic performance. It’s fully breathable with thermoregulating and sweat-wicking properties. Designed with professional athletic pattern for unmatched fit and comfort. It scores a 9 out of 10 because this rash guard has it all. The Scramble ranked rash guard v3.0 is one of the top rash guards in the game today. It’s IBJJF legal and is great for no-gi competition. Made of superior quality polyester blend for maximum comfort. The colors are vibrant and all guidelines set by the IBJJF (International Brazilian Jiu Jitsu Federation) were followed. 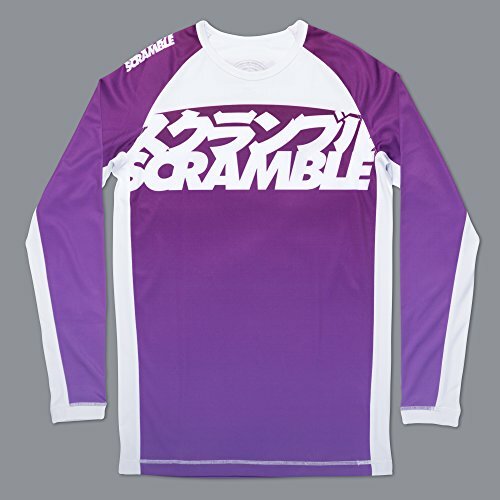 Scramble rash guards are world famous for the quality materials they use, which explains the high price-point. The polyester blend is far superior when compared to other rash guards on the market. This rash guard will last years, offering the absolute best balance between comfort and moisture-wicking. You can wash this rash guard many times and the color won’t fade away. We gave it a Guru Score of 8.5 because the high price-point isn’t the most appealing. The Gold BJJ camo rash guard is lightweight, ultra strong, and breathable. The Gold BJJ rash guard is made from a moisture wicking blend that feels incredible. It’s the perfect rash guard for gi or no-gi jiu jitsu, wrestling, MMA, surfing, or walking around looking like the Incredible Hulk. Fully sublimated digital print design. Screen printed rash guards can flake, peel, and crack. Not Gold, they sublimated printing so the graphics on their rash guard look as good after fifty washes as they do on day one. This rash guard is also backed by Gold’s guarantee, if there is any malfunctions on your rash guard within one year of purchase they will replace it. Tatami Fighting is one of the most respected names in Jiu Jitsu. 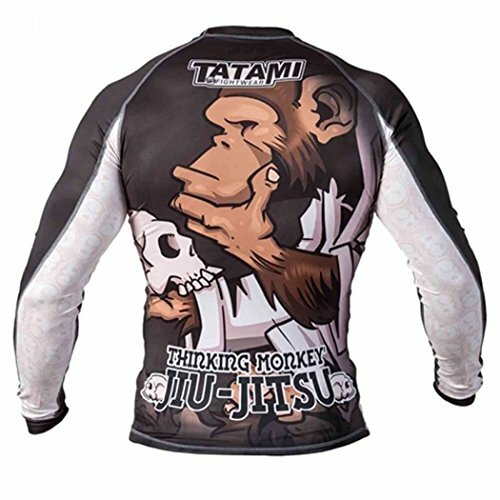 I felt required to include the thinking monkey design rash guard on this list because of the quality Tatami Fighting brings to the table. The design is great and won’t fade away thanks to the sublimated digital print. This rash guard provides protection around scratches or rashes so that your skin is safe in secure in this bad boy. The flat lock seams makes this rash guard super comfortable and durable as well. Tatami Fighting gets a 9 out of 10 on our Guru Score thanks to their amazing design and high quality rash guard. The Elite Sports rash guard has been battle tested by the world’s best athletes. It’s a multipurpose rash guard which means it can be used for MMA, BJJ, Cross Training, and even Surfing. This rash guard is great for better blood flow because it’s so lightweight! New honeycomb material was added under the arm and back for added strength. This rash guard has flat lock stitching and is made from a blend of polyester and spandex. The Elite Sports rash guard also comes with antimicrobial and anti-fungal treatment, so that you’re positive your skin is safe from infection. The fully sublimated graphics make the color long lasting no matter how many washes. The best part about this rash guard is the inexpensive price! Many people are surprised to find out that rash guards and compression shirts are not the same thing. In fact, all rash guards are not created equally, which is why we’ll review some rash guards below. Typical compression shirts are made of four panels and are not designed for constant contact and friction. Movements are restricted while wearing a compression shirt when compared to a rash guard. A compression shirt is also much more likely to ride up your abdominal and back while rolling, which is super uncomfortable (you’ll end up adjusting your compression shirt during rolls). On the other hand, good rash guards are constructed with a minimum of six panels (as compared to four in compression shirts). The stitching in rash guards is much more durable and built to resist sleeve pulls and stretching (similar to how gi’s are constructed). Bottom line is that rash guards are much more durable than compression shirts. I highly recommend picking up a few pairs of rash guards if you’re a serious Brazilian Jiu Jitsu practitioner. You’ll save time and money by investing in a few quality rash guards rather than continually buying cheap compression shirts that will get ruined within weeks of rolling. You’ve probably noticed a common color theme of white, blue, purple, brown, black, and red rash guards. When competing in IBJJF events and tournaments, you’re required to wear the color of your proper BJJ belt ranking. So before you buy a rash guard for competition, keep in mind that when you enter a No-Gi IBJJF competition you’re required to wear a rash guard that is at least 10% of your ranked color. If you don’t currently practice Brazilian Jiu Jitsu but would like to try it out, read our article on the 10 ways Brazilian Jiu Jitsu will change your life. 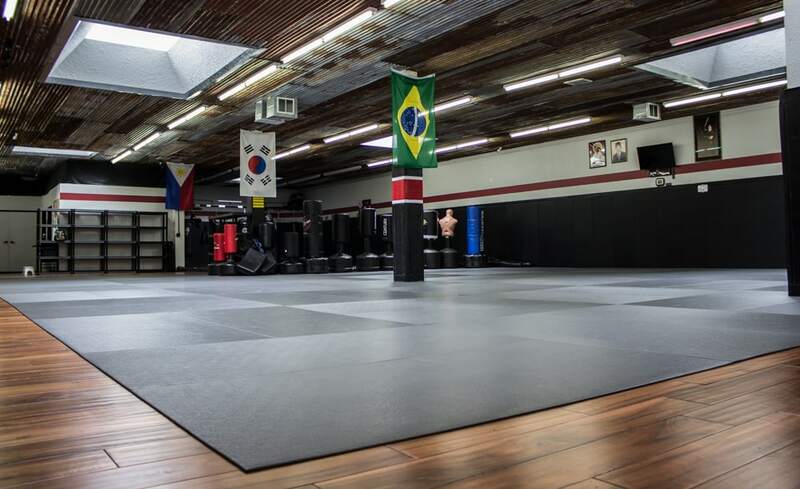 Please continue to visit The MMA Guru whenever you are looking for the best MMA, Boxing, Muay Thai, and Jiu Jitsu knowledge and guides.